Students may select their next project! In each of the options below, a sample game is provided. Try out the game and look at the code, but ﻿DON'T USE THE CODE﻿!. Students are expected to START FRESH with their own final project that is unique! If you use these tutorials, please let me know! Create a girl to be the model. (Recommend finding a photo of a person and use the GIMP with an "Edge Detect" or "Cartoon" Filter. Then, create clothing pieces (use the GIMP or Scratch). The Dress Up feature is built into Scratch, so there isn't any programming required for this. If time permits, please try to build both the Basic and Advanced versions. However, you must choose one to start. Mr. Rich found a dress-up game online (here) and modified it to demonstrate the BASIC VERSION (but with only 2 colors). When all clothing/accessories are matched correctly then display "YOU WIN"
Can create more clothing, to make the game more challenging. Make your own SPACE SHOOTER game! Start by building the BASIC VERSION and then move on to the ADVANCED VERSION. The sample game below is very basic (was found here). In the sample game above, the background (stars) don't move. Check out Mr. Rich's sample of a scrolling background. Shooter can move all over the screen. Have only 5 Enemy Space Ships. Have Enemy Space Ships arrive in 3 different formations. Have Enemy Space Ships die after one shot. Display "You Win" or "Game Over". May build some or all of these options. Probably need to base each level's success on a number of enemy space ships that are destroyed. Have "Health" points that decrease when Enemy Space Ships hit the Shooter. Have "Health Ships" that restore Health points. 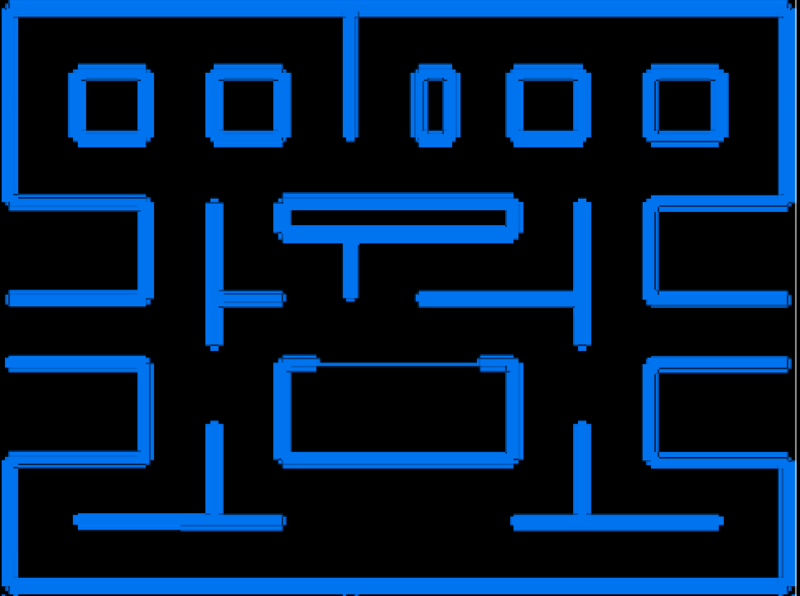 Also, try the Google Doodle of PAC-MAN to get some ideas of how the game plays. Here's some help to get you started. There are also instructions for Pac-Man from another teacher on YouTube. This Pac-Man has a big red dot in front of him. Therefore, we'll call him Rudolph-Man! There's also a completely different game ("escape the box" borrowed from here) that will be helpful here. It uses the same basic Scratch ideas of a changing Stage and movement only "IF TOUCHING COLOR". Have only 1 ghost that moves in a pre-set path. Have only a few dots to eat. (Eat all for the win). Have only 2 cherries for bonus points. Have one power-pellet that PAC-MAN can eat so he can eat the ghosts for bonus points. The ghost will need to change costumes so the player knows it is edible. Display "You Win" or "Game Over", based on success or failure. Very Very Hard: Whenever a ghost gets to an intersection, it should be able to choose any random direction available. Have each level full of dots to eat before "Level Up" (again, see the Google Doodle for ideas). Have at least 6 different bonus-point or bonus-life items (e.g. cherries, bananas, etc.) that only appear for a limited time. Have at least 4 power-pellets (spaced widely apart) so PAC-MAN can eat more ghosts. Below is a sample PAC-MAN background and also a sample game with it included as a BACKGROUND for the STAGE.